The National Research Institute for Cultural Properties, Tokyo, possesses a large number of letters sent to Seiki Kuroda (1866-1924), an oil painter deeply involved in the establishment of the institute. 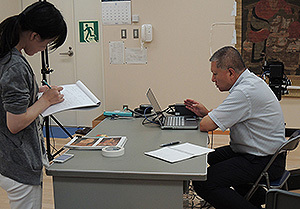 The Department of Art Research, Archives and Information Systems promotes republication and study on the letters as important materials to suggest a network of people surrounding Kuroda, while also asking for the cooperation of researchers outside the institute. As part of the efforts, we held a study meeting on August 31 for staffers at the department on letters from Saburosuke Okada, who established academia of Japan’s modern oil painting together with Kuroda. Presenters and titles of their presentations are as follows. 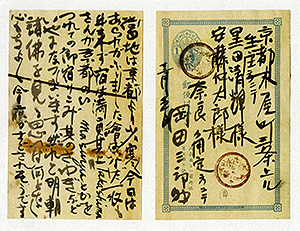 Seiki Kuroda said that letters in Saburosuke Okada’s own handwriting “are worthy of designation as a national treasure in the future.” This means that Okada rarely wrote a letter on his own. In the presentation by Ms. Takayama, she suggested that there is a difference in the handwriting in the letters sent to Kuroda under the name of Okada, and provided further insights into the persons who wrote the letters under the name of Okada. Okada’s wife Yachiyo, one of such persons, was also active as a novelist and drama critic. In the presentation by Mr. Matsumoto, he introduced a newly discovered manuscript of Yachiyo’s novel reflecting her own view on married couples as well as letters sent to Kuroda that were written by Yachiyo under the name of Okada. He showed the image of Okada through the eyes of a woman who was married to a painter. While letters in the modern age are generally seen as important as primary documents in the sender’s own handwriting, this study meeting offered an opportunity to reaffirm the difficulty of understanding letters through the case of letters written by other people under the name of a sender and the excitement of revealing new human relationships surrounding a sender by discovering his/her relationship with people writing letters for the sender. 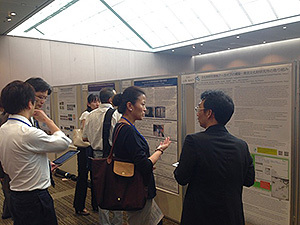 “2015 International Symposium on Conservation of East Asian Cultural Heritage in Nara” was held from August 26 to 29 at the Nara Kasugano International Forum IRAKA in Nara Prefecture, and we made poster presentations at a two-day expert meeting program held on August 27 and 28. 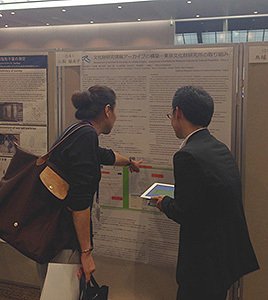 With the title of “Formulation of Cultural Property Research Information Archives – Efforts by the National Research Institute for Cultural Properties, Tokyo,” we made presentations on such topics as: (i) utilization of information resources and system building (ii) renovation of the library collection database retrieval system currently available on the institute’s website (using WordPress Works to make it possible to search all databases in a cross-sectoral manner and display search results collectively, changing from the current system in which users need to search respective databases individually), (iii) making research databases available for public use (using WordPress to make it easier to search existing image and text contents, and adding contents to the databases by releasing undisclosed images and other materials sequentially), (iv) cooperation and collaboration with organizations at home and abroad (cooperation with the Sainsbury Institute for the Study of Japanese Arts and Cultures in Britain and the planned joint research with the Getty Research Institute in the United States,) and (v) future activities. 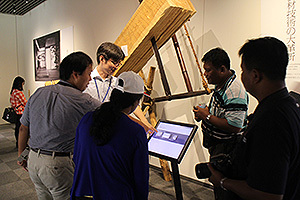 In addition to poster exhibitions, we conducted demonstrations using iPad and tablet devices, and also had the audience actually use the system. Through these efforts, we gave presentations in such a way that the audience could understand our measures for the renewed integrated retrieval system and library collection databases more precisely and clearly. We received feedback from the audience that they could understand the increased contents and better user-friendliness of the retrieval system and therefore make more use of the system for a wider range of purposes. In addition, we also received opinions that expect us to offer information to a large-scale portal website or to promote further cooperation with other institutions handling similar documents and materials. 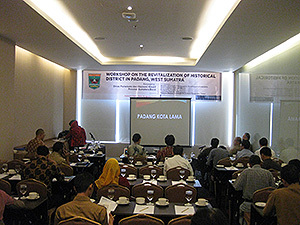 All opinions offered valuable insights unique to experts in cultural heritage in East Asia, their conservation, or information systems. We had a meaningful exchange of information concerning measures to offer the institute’s library collection at home and abroad. 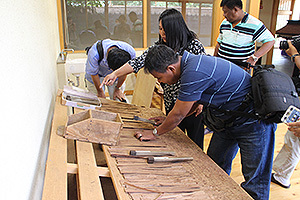 As part of the Networking Core Centers for International Cooperation in the Conservation of the Cultural Heritage Project, “Protection of Cultural Heritage in Myanmar,” commissioned by the Agency for Cultural Affairs, four specialists from the Department of Archaeology and National Museum of Ministry of Culture, Myanmar, were invited to Japan and a training session on cultural heritage conservation of wooden structures was held from July 29 to August 6. 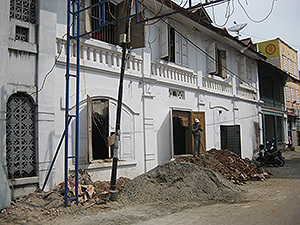 This program is one of a series of training that has been continued in Myanmar since fiscal 2013, and is intended to have trainees understand in detail the practices of immovable cultural property conservation and restoration in Japan. In addition to lectures on such topics as the history of conservation and restoration systems, survey recording methods, measures against insect damage, anti-seismic measures and carpenter’s tools, tours to restoration work sites, practice of a trail survey and an exchange of views with restorers were conducted to help trainees expand their knowledge about the conservation and restoration of wooden structures. The program also provided an opportunity to discuss together about methods that could be applied in Myanmar and other issues. During their short stay, the trainees toured many restoration work sites as well as cultural heritage sites such as museums, historic parks, and groups of traditional buildings. On the last day of the training session, each trainee made a presentation of the results of the training one by one. Despite such a tight schedule, trainees ardently learned and absorbed many things. While feeling differences in climates or architectural cultures between both countries, trainees apparently became aware of underlying cultural commonalities in many scenes. In order to make use of the training for the future of the protection of their own country’s cultural heritages, trainees enthusiastically raised and asked various questions in each site, which apparently gave a strong impression to Japanese engineers and specialists. Finally, we appreciate the Japanese Association for the Conservation of Architectural Monuments, the Kyoto Prefectural Board of Education’s Cultural Properties Division, the Takenaka Carpentry Tools Museum as well as all the organizations and parties involved for their cooperation in this program and training session.